If it’s Sunday, it’s Meet the Press without Rand Paul. If we could start this year’s fight for health care reform over, one thing which should have been different would have been to make better use of Barack Obama. The speech he gave before Congress last week probably should have been delivered months ago, before the debate became dominated by misinformation from the right. When Obama did not speak out enough, the vacuum was filled by people such as a crazy lady in Alaska writing on Facebook. Obama is now making up for this mistake. After being all over last week, he will be on virtually all the Sunday interview shows. This weekend he will appear on all three of the network Sunday interview shows: This Week with George Stephanopoulos on ABC, Meet the Press on NBC and Face the Nation on CBS. He will also be interviewed on CNN and Univision. Apparently Obama is limiting his interviews to legitimate news organizations. As of now there are no plans to be interviewed on Fox. The new show on MSNBC, to debut in late spring, would give Mr. Todd more experience as a political moderator and provide him with a good opportunity to develop his long-form interviewing skills. At the same time, it would give MSNBC an original political program to show off on a weekend schedule that is currently dominated by crime documentaries and taped content. According to sources, the specifics of the show—live vs. taped, one-on-one interview vs. a panel of guests, half-hour vs. an hour, Saturday vs. Sunday—are still being worked out. Presumably the show will originate out of NBC’s Washington D.C. bureau, where Mr. Todd is stationed. Staffing has yet to be determined. The only problem is that there are now far too many political shows to even try to keep up with, unless someone wants to spend a big chunk of the weekend watching television. Besides the major interview shows from each network there is a growing number of additional shows. Chris Matthews has one Sunday show where he is generally calmer than he is on Hardball. Perhaps the best of the newer Sunday interview shows is Fareed Zakaria — GPS on CNN. Update: On second thought, Todd has been disappointing in some of his questions since moving to White House correspondant (as I noted here). Hopefully he will improve on an interview show. Last night’s press conference (transcript here) was not terrifically newsworthy. What was most significant was that Obama is already on his second press conference in office. In comparison, both Bill Clinton and George Bush each only had four news conferences during eight years in office. Here’s the list of reporters in order: Jennifer Loven (AP), Chuck Todd (NBC), Jake Tapper (ABC), Chip Reid (CBS), Lourdes Meluza (Univision), Kevin Baron (Stars and Stripes), Ed Henry (CNN), Major Garrett (Fox News), Mike Allen (POLITICO), Kevin Chappell (Ebony), Ann Compton (ABC Radio), Jon Ward (Washington Times) and Stephen Collinson (AFP). In a year in which the print media is already having serious problems, it is notable that reporters from major newspapers such as The New York Times, The Wall Street Journal, and The Washington Post did not get any questions. The most significant newspaper to get a question was the conservative Washington Times. Broadcast media did well, along with outlets which are often overlook such as Stars and Stripes and Ebony. I might have to reconsider my support for Chuck Todd to take over as moderator of Meet the Press if he continues to ask questions as bad as the one he asked last night. Chuck Todd asked why Obama isn’t asking for more sacrifice from Americans as might be expected during a crisis such as a war. While it makes sense to question Bush’s attempt to pay for the Iraq war on credit and not have any sacrifices by Americans, this is hardly an analogous situation. The whole point of government action during difficult economic times is to try to reduce the suffering of those who are already suffering and making sacrifices. The important point with Obama is that the content, command of fact and concept, and overall intelligence of his extemporized answers matched that of the scripted presentation. That could not have been so if he were teleprompter-dependent. For example: by the end of his term, George W. Bush had become quite effective in delivering a formal speech. His interview- and press conference performance if anything deteriorated through his time in office. The whole “Obama can’t talk on his own” concept is bizarre, given his performance through two years of stump speeches and debates during the campaign. But it seems to have gotten so much credence in the right-wing world that it is worth addressing head on. “I think the party has to stop shouting at the world and at the country,”Powell said. “I think that the party has to take a hard look at itself, and I’ve talked to a number of leaders in recent weeks and they understand that.” Powell, who says he still considers himself a Republican, said his party should also stop listening to conservative radio talk show host Rush Limbaugh. Unfortunately that is the kind of party the Republicans have become. 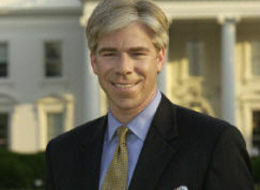 David Gregory is reportedly to take over as host of Meet the Press. He did have his good moments when pressing the Bush administration during press conferences, but he has all too often repeated lame Republican talking points. Are there also any political junkies who do not consider him one of the most boring hosts of network or cable newscasts? Gregory, 38, celebrated his 30th birthday — complete with cake — aboard George W. Bush’s presidential campaign plane, the assignment that solidified his stature as a network rising star. Enjoying a gravitas boost from his prematurely salt-and-pepper mane and friendships with Tom Brokaw and other of the legendary figures of NBC News, the Los Angeles native quickly became one of the hottest personalities in network news. Eating cake with Geroge Bush, being a friend of Tom Brokaw, and having premature gray hair does not make one a great journalist. Since I did not think there was much hope that Jon Stewart would get picked, or even that NBC would go with Steve Benen’s top choice of Rachel Maddow, I was hoping that Chuck Todd would be chosen. I think that he was the only one now at NBC who could maintain the current position of Meet the Press as the top Sunday interview show. John McCain is trailing in the polls with nine days left. To get back in the race he needs to dominate as many news cycles as possible. Looking ahead, Obama will be on three broadcast networks during prime time later in the week, probably denying McCain at least one additional day to gain ground. Today might have been McCain’s best chance for a positive day, appearing on both Meet the Press and CNN’s Late Edition. I already commented on these interviews here, with McCain failing to say anything to help his campaign. Making matters worse, the next big story after Palin’s spending on clothes has become the internal friction within the campaign. “She is a diva. She takes no advice from anyone,” said this McCain adviser. “She does not have any relationships of trust with any of us, her family or anyone else. Well, it’s the word “diva.” It’s a word that is never applied to men. It’s generally applied to a woman to describe an overly ambitious woman. And there may be many things you can say about Sarah Palin regarding her qualifications or experience, but she’s no more ambitious than any other politician, certainly not Joe Biden or any other vice presidential candidate in history. So, I think going to that level and using that word in particular says more about the person on the McCain campaign who used it and the way this is devolved into sort of low-level name-calling than it does anything about Sarah Palin. Such conflict, especially in losing campaigns, is not uncommon. Stories spread after the election how John Edwards placed his own interests in a 2008 run over the good of the 2004 ticket, but Kerry’s frustration with Edwards was kept quiet until after the vote to avoid further harming their chances. Like the silly stories I mentioned yesterday on the faked attack and McCain’s brother, the friction between McCain and Palin is not something to base one’s vote on, but having the news be dominated by such stories does make it more difficult for McCain to catch up to Obama. I’m also not sure that having this come out now helps Palin’s already questionable hopes for the nomination in 2012. This is even more ridiculous than John Kerry’s quote on voting for an appropriation before he voted against it. In Kerry’s case he was talking about two different bills and it made sense for him to change his vote as there were significant changes in where the money was coming from in the second bill which he voted against. McCain is talking about vetoing bills he actually voted for. He did have the opportunity to vote against them. John McCain was also interviewed on Meet the Press today. He repeated the same claims which have been debunked many times about Obama’s tax plans and continues to suggest that Obama is a socialist. This makes me wonder if McCain even knows what socialism really means. Obama has no plans which come remotely close to the state taking over the means of production or eliminating private business. McCain tries to equate taxation with socialism, but that hardly flies when Obama is calling for lower taxes on most people than John McCain is, and when even those who will see a tax increase would still be paying lower taxes than they were under Ronald Reagan.